Yay! I’ve missed you. Keep stopping by hoping that my Google Reader deal just forgot to pick up your newest post. Hope to hear more from you soon. Oh cool – where is that taken? I do that every chance I get! Hi everyone! Thanks for commenting after my long silence. I hope to post a real post soon. That picture is taken in Bar Harbor, Maine, where Hobgoblin and I just spent a week. I was reading while Hobgoblin did some beach combing. I actually almost got trapped by the tide, which is something I forget about, not being much of an ocean person! It sounds like you had a great time! Welcome home (though I know it will be an adjustment…). Wonderful! So glad you are enjoying the summer! What a great picture! Sounds like you are having a great time. Want to here more about your adventures. Now that’s the way to live!! I’ve been to Bar Harbor twice and it is so perfect. Thanks, everyone! I’m missing Maine already and wondering when I’ll go back … 🙂 I recommend that you visit if you get the chance! Glad you’ve enjoyed your summer teaching and vacation. 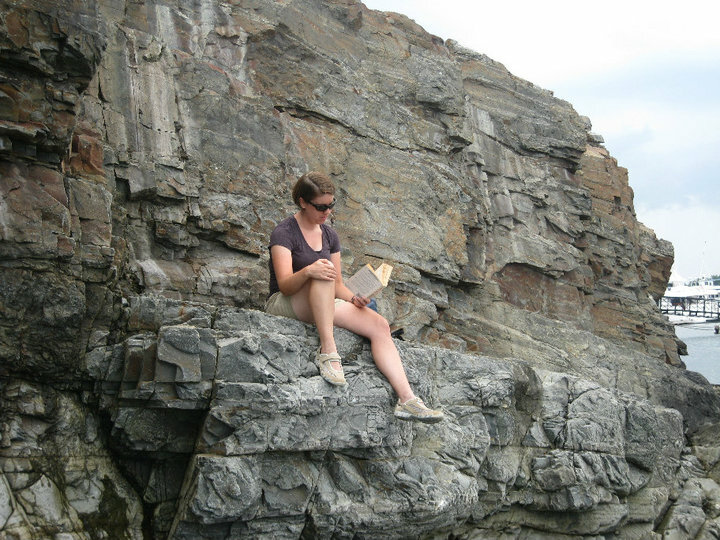 Just curious what you were reading among the rocks. Welcome back Dorothy. I look forward to reading your summer reading posts, but of course… no pressure. Have a good one, whatever’s left of it. Arti — I was reading Manservant and Maidservant, the Ivy Compton-Burnett I was supposed to post on for the Slaves of Golconda. Oops! I really enjoyed it and may post briefly on it.